Total solar eclipse, 20 March 2015, 9:41am - the Faroe Islands will be one of only two places in the world where this natural phenomenon can be observed from land (the other is Svalbard). Travel to this remote and green archipelago of 18 tiny islands, inhabited by just 40,000 people and 70,000 sheep. Hills, valleys, waterfalls and lakes form the part of the landscape, the dramatic cliffs are a favourite with seabirds, and the surrounding waters are dotted with spectacular seastacks, some steeped in legend. The first record of a total solar eclipse in the Faroe Islands was 30 May 1612 at 11:25am. An ancient story goes that four quarrelsome brothers from the village of Sumba were tending to their sheep and arguing, when they were suddenly shrouded in darkness. They were petrified and promised the Lord that if they lived through the terrible experience, they would live harmoniously. The sun soon reappeared and the brothers never quarrelled again. 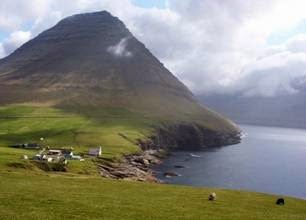 During the week of 20 March, eclipse parties, gatherings and festivals will take place across the Faroe Islands. Please see the Total Solar Eclipse website for the latest information. Access: A special direct flight from London, to coincide with the eclipse, will be operated by Atlantic Airways. Please contact the airline direct on booking@atlantic.fo (online bookings are not possible). An alternative option if to fly via Copenhagen, Oslo or Keflavik.